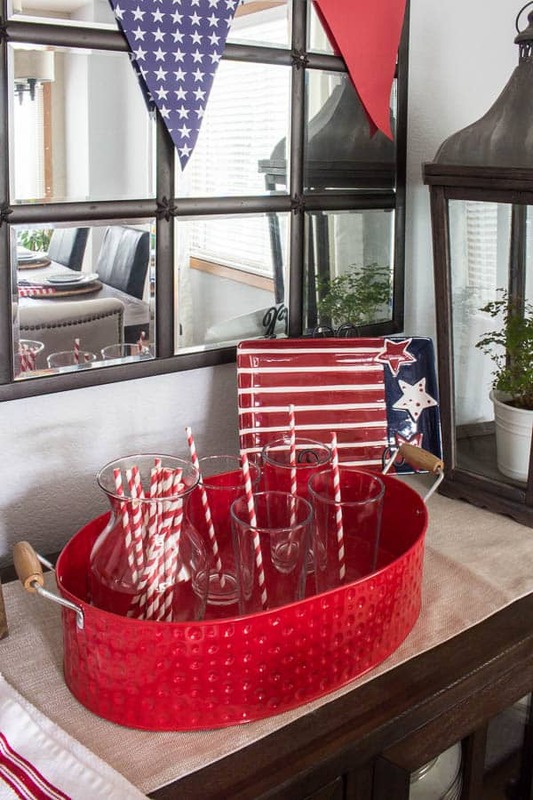 Don’t blow up your bank account celebrating the 4th of July– create an amazing patriotic tablescape on a budget! 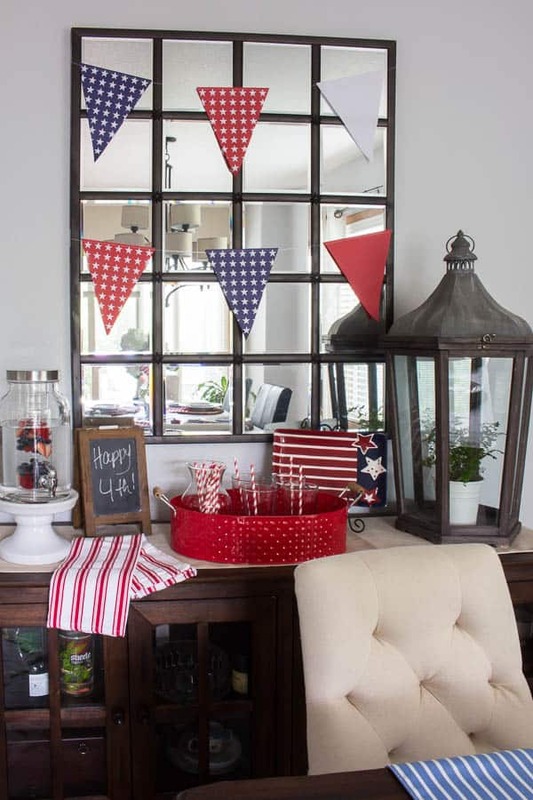 Can you believe the 4th of July is exactly one week away from today?! 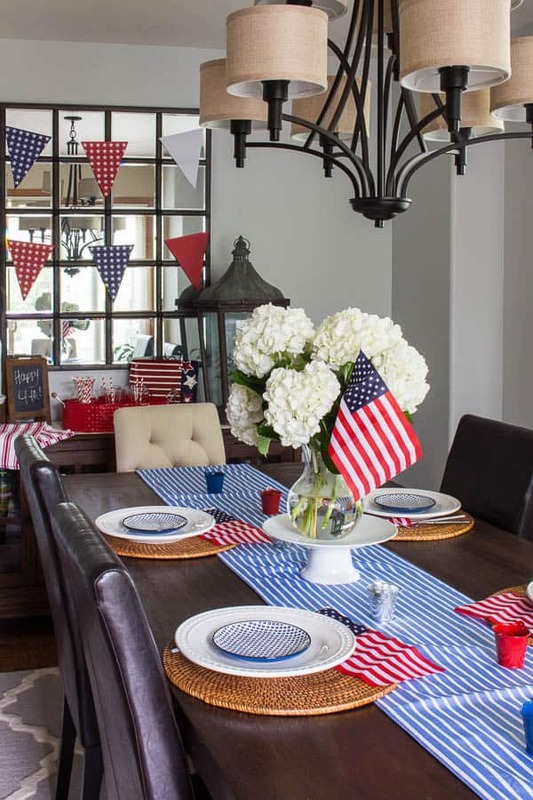 This past weekend I decorated my dining room to host a fun 4th of July party. I only spent like an hour of time and $35 to get my whole dining room all ready to party. 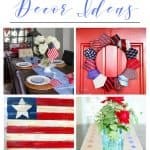 I wanted to show you how easy it is to create a beautiful patriotic tablescape on a budget. You don’t need a ton of time or money. 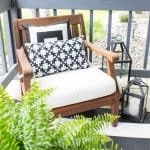 It’s as simple as shopping your home and a couple discount stores! 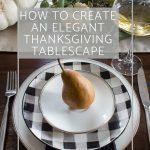 The first item needed when creating a pretty tablescape is the table covering. There are a ton of options here: a full tablecloth, runner or both. A nice blanket can even make a wonderful tablecloth. And for runners, a simple scarf or even wrapping paper can work. It’s all about the layers! Generally, my home is filled with lots of neutrals. 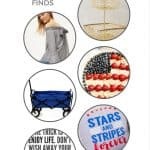 But I wanted to see if I could find anything that was still somewhat neutral but would work with the red, white and blue patriotic theme. 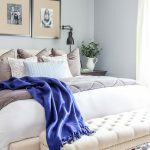 I made a quick trip to Homegoods where I found this blue striped runner on clearance! It was only $12 bucks, so I had to get it. I then visited my local Dollar Store to gather some patriotic decorations because I was little lacking in the red and blue colors. I found the banners, some little metal buckets for candles, and a few flags. All for $1 each. Not bad right?! Then I simply shopped my home for anything I could find that would coordinate. I knew my rattan chargers would add another layer of texture. 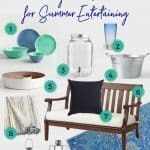 I grabbed some white dishes and a few dessert plates that had some blue dots for a fun pop of color. 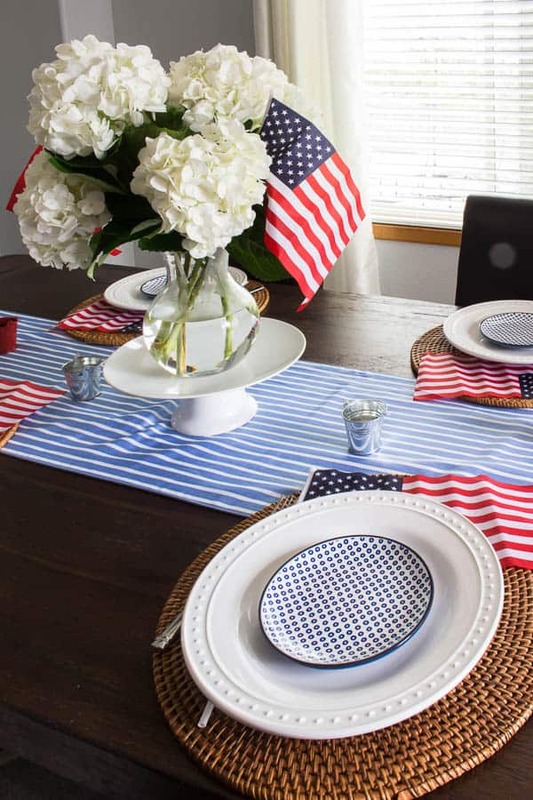 A flag was placed at every place setting so no one is left out of the patriotic fun! 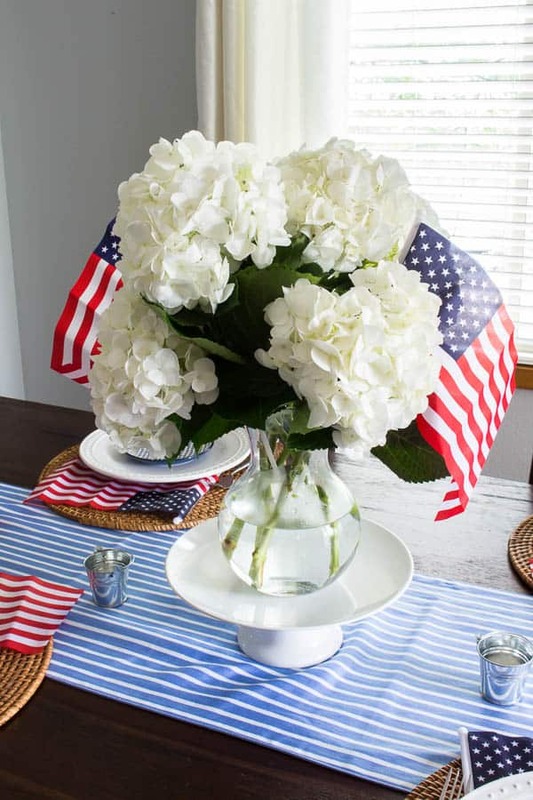 I grabbed my cake plate and a simple glass vase for a beautiful hydrangea centerpiece. To me, hydrangeas flowers scream summer! Although any flower from the yard would be beautiful too and hey, it’s free! 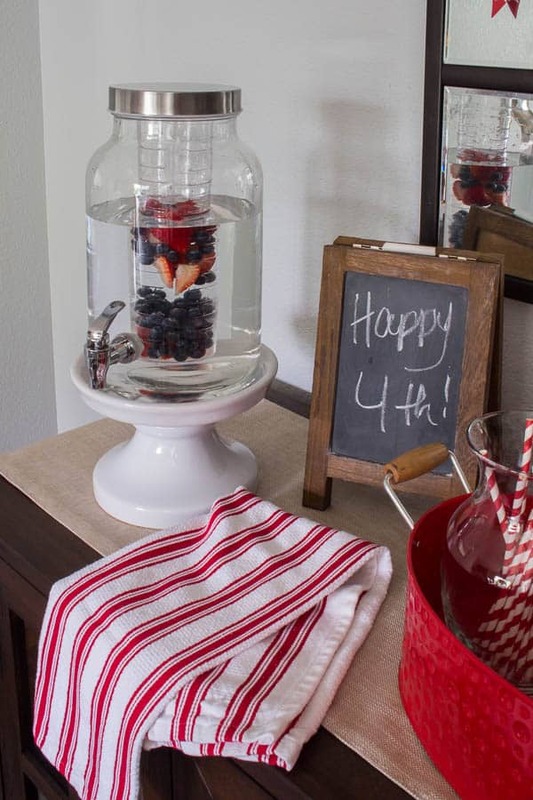 I grabbed a cute little chalkboard sign from my living room and a red and white tea towel from the kitchen for one more pop of red. 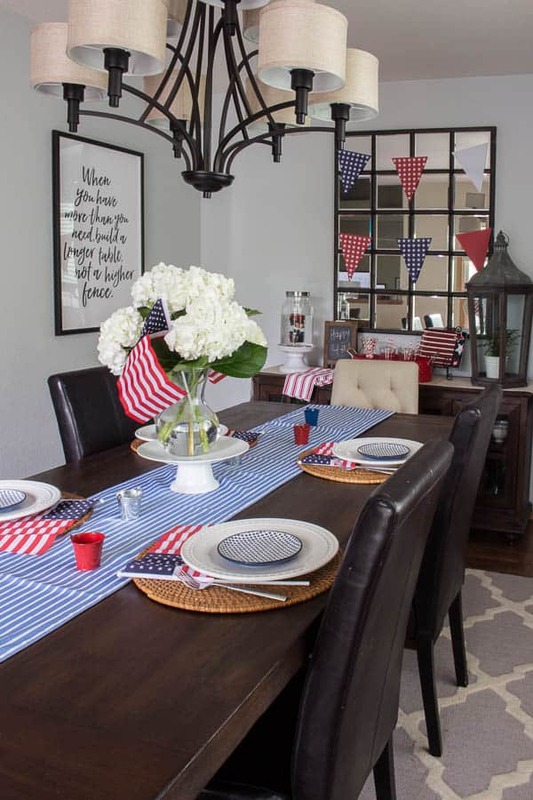 And there it is…a fun decorated dining room all ready to celebrate the 4th! 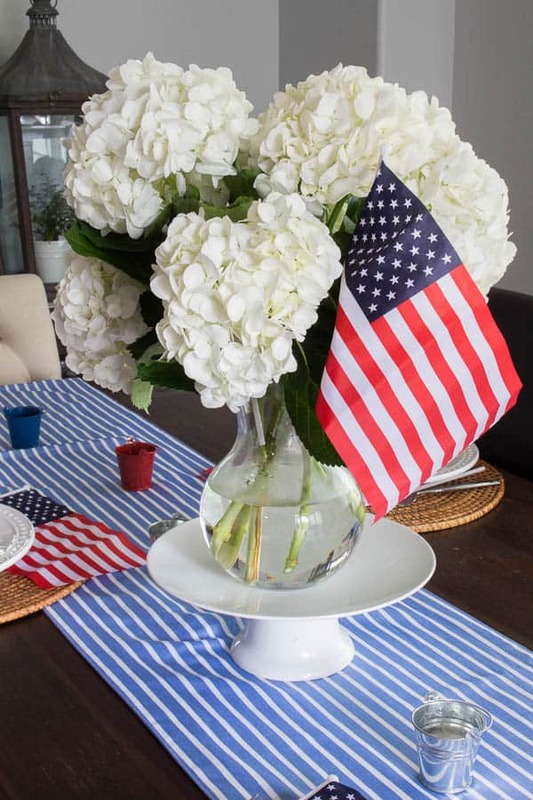 Do you have tips on how to create a patriotic tablescape on a budget? Please comment and let me know! So fun and so clever. I think we can all agree not to splurge on this Holiday. So festive, Laura! You did a great job! I’m all about saving some money, so I think you’ve nailed it with this table! 🙂 It’s perfect! 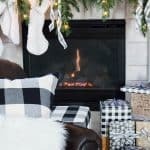 This is a great affordable way to decorate for the holidays! 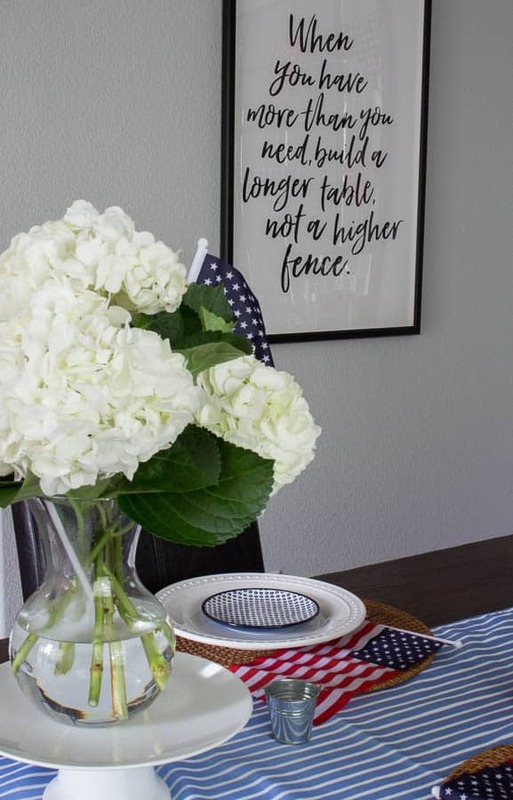 I love the festive banner and the beautiful hydrangeas! 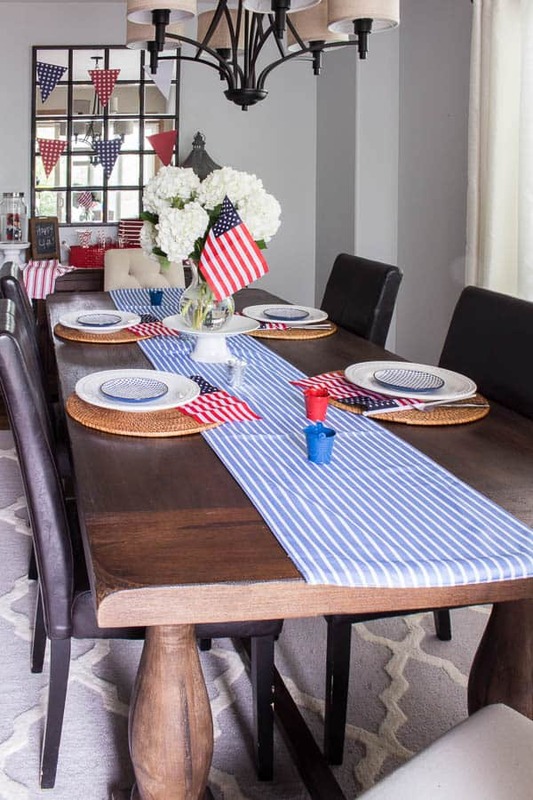 It just goes to show you really don’t have to spend a lot to get the perfect holiday table! What a fun table! 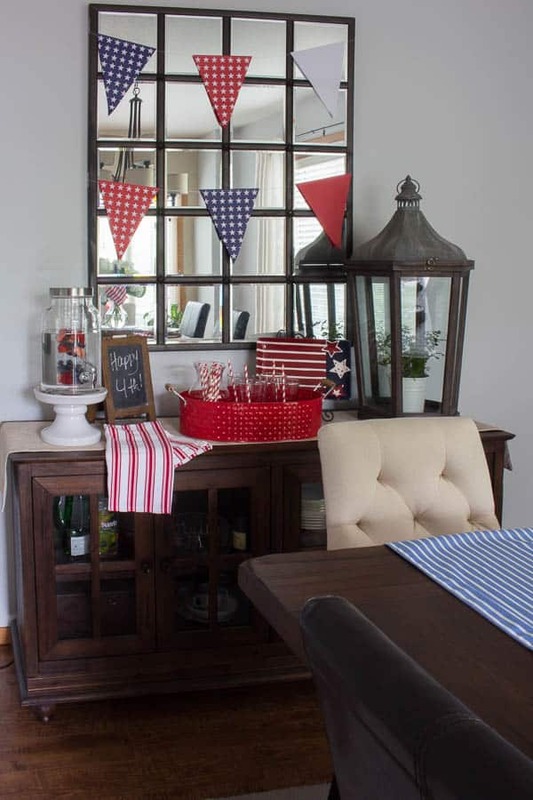 I love all the stripes, and the bunting on the wall is perfect! 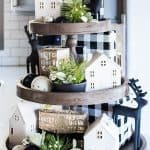 There are so many sweet touches, I love them all!